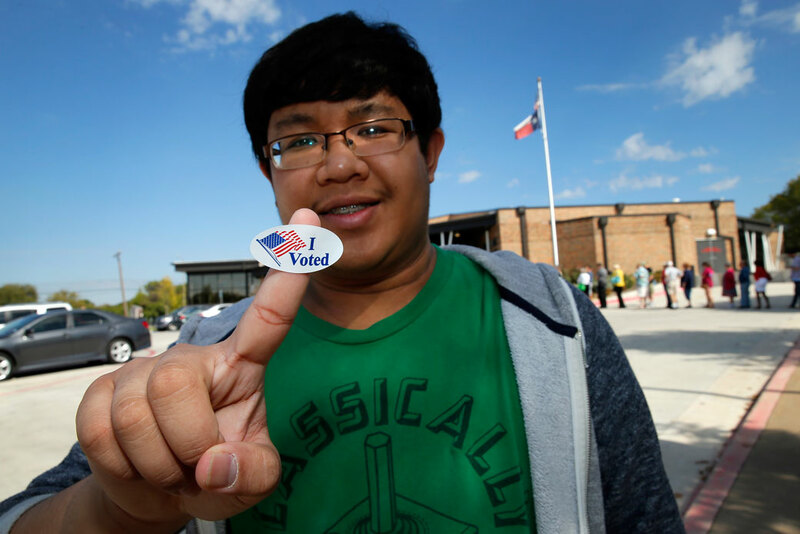 Timothy Sinon-Allas, a student at the University of Texas, Dallas, holds up his "I Voted", sticker after early voting, October 27, 2016, in Dallas. Oregon’s first election with automatic voter registration suggests it may be transformative for youth voter participation. Millennials today number more than 83 million individuals and account for nearly one-third of both the labor force and the eligible voting population. Millennials now surpass Baby Boomers as America’s largest generation.1 Beyond sheer numbers, Millennials also represent the most diverse generation in American history; an unprecedented 44 percent of Millennials identify as a person of color.2 By 2020, Millennials are expected to make up 40 percent of the eligible voting population.3 Millennials are steering our country toward a future that is even richer and more multicultural than our past.4 This changing American electorate, however, has yet to fully realize its political voice. The Millennial generation faces a unique set of structural economic challenges with which their predecessors did not have to contend. These challenges—including the $1.3 trillion student debt crisis, a negative savings rate, and a youth unemployment rate that is twice the rate for all workers—forestall many young Americans’ path toward economic stability.5 As Millennials pursue higher education, launch careers, and delve into the world of parenting and caregiving, these barriers to socioeconomic stability become more pronounced. Automatic voter registration (AVR) is a policy tool that addresses youth voter registration problems and helps ensure that young people—who are the future of the country—can have their voices heard on the issues that affect their lives. Put simply, AVR removes much of the bureaucratic red tape that keeps young people from voting. For example, with AVR, registration information can be automatically updated each time a voter moves. It takes the guesswork out of knowing where and how to register because public agencies automatically register eligible citizens to vote unless they decline. By implementing AVR systems in states across the country, the political power of the Millennial generation can be realized. Current voter registration structures act as a barrier to young people for a variety of reasons. First, Americans are highly transient. On average, around 12 percent of all Americans move each year.32 Between 2013 and 2014, almost one in every nine people changed their place of residence.33 Young people are especially likely to move frequently. Americans between the ages 18 of 29 change addresses at more than twice the annual rate of Americans age 30 and older.34 Under the current voter registration structure, eligible residents must re-register to vote every time they move; this means young people are disproportionately more likely to lose their registered voter status—often without even realizing it. Only 13 percent of young voters held accurate understandings about their state’s voter registration deadline. Finally, most Americans lack the knowledge of where or how to register. This is particularly severe among young people and people who move regularly. In 2014, for example, 1.9 million people failed to register because they did not know where to register or how to do so.41 And 735,000 potential voters were prevented from having their names added to the voter rolls because of language barriers in the registration process.42 In 2016, North Carolina threw out more than 25,000 votes because the voter was not properly registered.43 Hundreds of thousands of votes were discarded due to registration status in 37 other states.44 Young people are among those most affected by voting registration barriers. In the absence of universal, meaningful civic education in schools, many young Americans simply lack basic information about where, how, and when to register—or even that they need to register. America has a long history of using voter registration barriers to prevent certain groups of people from exercising political power. In the wake of the Civil War and ratification of the 15th Amendment, registration requirements were set up that kept African Americans from exercising their franchise.45 These suppressive laws included requirements that only those living in cities could register, or that an individual must change his or her registration upon moving, regardless of how far; other laws required in-person registration, but only on certain days and at limited times.46 The Voting Rights Act (VRA) was designed to remove obstacles that made it harder for people of color to vote, while other important advances in voting rights and voter access—including the National Voter Registration Act (NVRA), same-day registration, and online voter registration—have addressed inconvenient and exclusionary voter registration practices. Despite this progress, however, the process for registering to vote can still be a labyrinth that prevents and dissuades would-be young voters from registering. As most registration processes stand today, it is the sole responsibility of the voter to make sure he or she is registered to vote and reregister with every move.47 This means that potential voters must navigate secretary of states’ or DMV websites to determine how to register and about their states’ registration deadlines.48 While 38 states plus the District of Columbia already allow or will soon allow online registration, others require voters to register in-person or by mail.49 In-person registration requires an individual to take time out of their day—from work or school—to go to the nearest registration center, often a county clerk’s office or other governmental facility. For those who do manage to re-register, they often use paper forms, which can lead to inaccuracies due to typographical errors.50 Paper registration also requires county officials to hire staff for the purposes of processing data from paper cards.51 It is time to modernize our voter registration systems to securely register America’s missing voters so that all citizens can have a say in making the decisions that shape our collective futures. In March 2015, Oregon became the first state to adopt automatic voter registration thanks to a multiyear campaign begun by Alliance for Youth Action affiliate, the Bus Project, and led by civic, youth, student, and civil rights groups.52 The new system was launched in 2016 and already looks potentially transformative. Between the 2012 and 2016 general elections, the number of registered Oregon voters age 18 to 29 increased by more than 100,000.53 During the same period, the eligible-voter population of that cohort grew by just more than 12,000 people.54 This massive growth in the registration rate of Oregon youth contributed to Oregon reaching more than 50 percent voter turnout for all adults younger than age 30 in the 2016 general election.55 When compared to the 43 percent turnout rate for the same population in Oregon’s 2012 election, the effects are evident: Eligible young voter turnout increased by 7 percentage points—representing 45,988 new young voters casting ballots.56 The 2016 and 2012 electoral environments were extraordinarily similar: There was no presence of active presidential campaigns in the state, nor any competitive gubernatorial or senatorial statewide elections. While causation is difficult to determine, it is likely that a portion of this turnout increase was driven by the new voters added through automatic voter registration, along with the hundreds of thousands of automatic registration address updates that ensured Oregon’s all-mail ballots reached voters at their new homes.57 A 7-percentage point increase in turnout is an unusually high boost following the implementation of a single voting reform. It bears noting that 2016 was the first year of operations for Oregon’s AVR system, and it is likely that the percentage of eligible Oregonians automatically registering to vote—and the percentage voting—will rise in the coming years as more individuals interact with the system and are added to the rolls. Oregon’s automatic voter registration system focuses on registering eligible voters through records collected by the DMV, whose driver’s license, learner’s permit, and identification card applications require all information necessary to determine eligibility to vote in general elections. When an Oregonian provides their name, address, birth date, and citizenship status to the DMV, the agency securely forwards the information to the Elections Division in the office of the secretary of state. Prior to automatic voter registration, the Oregon DMV already tracked what types of proof of legal residency were provided, requiring no change in practice to acquire this information. Applicants who provide proofs of residence that lack confirmation of American citizenship are not passed through to the secretary of state, nor are individuals with protected records due to safety concerns. A similar process applies to address updates received by the DMV. Under this process the DMV forwards all address updates to the Oregon Department of Elections, which verifies the new information against the current records in the state voter file and updates the voter address if it appears to be more current than the voter registration record. Voters who have had their address updated are sent a postcard informing them of the record change, and providing instructions on how to correct any possible mistakes in the update. The efficiencies also extend to the nonpartisan civic space. Oregon’s coalition leader for automatic voter registration, the Bus Project, initially pursued AVR after undertaking a field-based voter registration drive that registered more than 23,000 people to vote. Concluding that the work was of vital importance but also woefully inefficient and logistically near-impossible to scale to truly reach a critical mass of eligible voters, the group decided to seek systemic solutions.64 The Alliance for Youth Action calculates that a registration drive that successfully registered 23,000 people would require 7,700 person-hours in the field, plus an additional 2,000 to 3,000 person-hours of preparation, processing, and management.65 When voter registration of eligible citizens occurs automatically, nonpartisan civic groups can turn their attention toward much-needed civic education and voter engagement. Oregon’s legislators and advocates deserve significant kudos for passing and implementing America’s first automatic voter system, offering a model to the nation. However, the combination of Oregon’s local policy idiosyncrasies and the challenges of enacting first-of-its-kind policy leaves room for improvement of the Oregon model. States have an opportunity to build on Oregon’s policy to achieve an even stronger policy that removes barriers for eligible Americans to exercise their right to vote. A fully realized automatic voter registration system should partner with multiple widely used public agencies, including the Department of Motor Vehicles. For Millennials, the most obvious drawback of limiting AVR to the DMV is that fewer young people are getting driver’s licenses—just 77 percent of 16- to 24-year-olds applied for a driver’s license in 2014, as compared to a high of 92 percent in 1983.66 After slightly less than a year with DMV-only AVR, 486,700 young people were registered to vote—leaving nearly one-fourth of the state’s 643,861 young voting-age Oregonians unregistered.67 While this registration rate is still likely to rise in coming years, it is unlikely to reach comprehensive levels without utilizing other agency records. In some states, the DMV is the only agency that has the technical capacity to allow voters to automatically register to vote; lawmakers, administrators, and advocates should therefore prioritize having additional agencies participate in the AVR systems as soon as they are technologically capable. By extending the capacity to collect and process voter registration information beyond DMVs, states will ensure that their new AVR systems work as efficiently as possible and reach the largest number of potential voters. Agencies such as veteran services, Medicaid, hunting and fishing licensing, departments of revenue, or other state agencies that collect name, age, address and citizenship information, would be good candidates for AVR. One of the most important advances in voter registration in America’s history is the federal National Voter Registration Act of 1993, which, in Section 7 of the legislation, requires public assistance agencies to offer voter registration services.68 Building on Oregon’s success using records from the DMV, the next logical step is to explore ways to securely add NVRA-designated public assistance agencies to provide voter registration services. States should focus on expanding AVR services to public assistance agencies serving low-income families and rural communities. As federal law already requires public assistance agencies to provide voter registration services to all clients, making voter registration totally automatic is the next step in using available technology to lower barriers to voter participation by eligible citizens. Other public assistance agencies are similarly well suited to explore adding to AVR systems. These agencies include public college and university systems, public secondary education systems, and departments of corrections. State departments of education could, for example, integrate AVR through class registration for students at public high schools. Additionally, state departments of corrections could implement AVR for their incarcerated populations, thereby ensuring that citizens who are voting-eligible upon release from prison are immediately enfranchised and able to participate. States, however, are primarily constrained from expanding AVR to additional public agencies outside of DMVs by two challenges: agency database variability, which limits the ability of agency databases to communicate, and voter eligibility verification. In particular, as individual agencies often follow distinct procurement practices, different agencies within the same state can use dramatically different software to store similar data. Such database variability can inhibit many public assistance agencies from participating in AVR as it renders connecting to state departments of elections difficult. Many state databases, however, are soon due for updating, and states should prioritize acquiring databases that can communicate with one another. Another potential solution is the development of secure software to act as an intermediary between databases. While adding additional agencies to the mix is paramount to fully realizing the potential of automatic voter registration, states should only incorporate these new agencies once they have confidence in the agencies’ ability to accurately determine voter eligibility and protect ineligible people from inadvertently being added to the rolls. The Oregon system incorporates voter notification and opt-out opportunities through the post office. States could also consider offering a front-end opt-out that similarly ensures that voters both understand their opportunity to decline and do not unintentionally decline voter registration. For example, this process could be incorporated into transactions with the agency by having Voter Status Adjustment cards automatically given to the individual based on the information already provided to the DMV during the transaction. If the individual wanted to decline being registered to vote or having their address updated—or wanted to affiliate with a political party—they would return their completed cards by either mailing to the elections office or dropping it in a secure lock box at the agency to be transferred to the state elections office. EDR can serve as a failsafe so that eligible people who have not been registered through AVR can still have their voices heard. EDR alone, however, still misses the opportunity to mobilize young voters through pre-election outreach. The primary difficulty with EDR is that its structure means that many voters remain outside of the electoral system for much of an election season. Campaigns and nonpartisan get-out-the-vote, or GOTV, drives have been shown to increase voter turnout for the people they contact, but rely on public voter lists.74 Eligible voters who remain unregistered until Election Day therefore are rarely contacted by GOTV efforts, and thus are less likely to show up to the polls. Furthermore, as they are not included on voter lists, these unregistered eligible voters are not offered any state-provided voter education, such as polling place locations and hours. Ideally, EDR should be paired with automatic voter registration to increase voter turnout and provide maximum mobilization and education for eligible voters. Automatic voter registration cannot solve youth voter access and participation problems on its own. Therefore, states should use AVR as a key portion of a suite of policies to expand voting, including Election Day voter registration, pre-registration for 16- and 17-year-olds, portable voter registration, online voter registration, no-excuse mail balloting, and usability-focused voting centers open to all voters in a county. These comprehensive reforms would offer voters a highly convenient and secure election system while providing administrators the tools they need to successfully administer modern and secure elections. With an aging voter registration infrastructure preventing millions of voters from casting their ballots, implementing AVR across the country would go far to ensure that all Americans—Millennials especially—have their voices heard and concerns represented in government.77 AVR can overcome the barriers faced by America’s young voters, and finally provide Millennials with the opportunity to realize their full political potential and exercise ownership of the democracy that they will one day lead. Henry Kraemer is the program director at the Alliance for Youth Action. Liz Kennedy is the director of Democracy and Government Reform at American Progress. Maggie Thompson is the executive director of Generation Progress. Danielle Root is the voting rights manager at American Progress. Kyle Epstein is the press associate for Generation Progress.